I finished this charming middle grade debut by Alison DeCamp in about two sittings and didn’t stop smiling the whole time I read it. 11-year-old Stan is a refreshing, winsome protagonist on the hunt for his formerly-dearly-departed but now, as it turns out, just-long-lost father in 1800s Michigan. 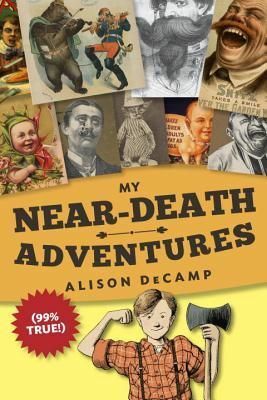 DeCamp has written her folksy story in the style of a scrapbook filled with 19th and 20th century photos (on top of which are Stan’s own doodles; think a less scribbled “Diary of a Wimpy Kid” set on the Western Frontier) and the effect is funny and clever and delightfully over the top. It’s always nice to see a solid preteen outing on the YA shelves, and I think this will have a wide appeal for boys and girls, history buffs and comedians. There are some lovely, poignant moments as Stan struggles to grow up, fit in, and find his “manliness” surrounded by a group of colorful lumberjacks. Just an all-around great outing. I can’t wait to see what we read from DeCamp next! This entry was posted on April 1, 2015 at 8:58 pm and is filed under Uncategorized. You can follow any responses to this entry through the RSS 2.0 feed. You can leave a response, or trackback from your own site.